The days of vocabulary quizzes may be long gone, but there are a few terms on your professional liability insurance policy that you need to know in order to understand your coverage. Being familiar with these terms will ensure that you are properly insured, so when a claim is made against you, there is no question that you are covered. Occurrence Coverage: This means lifetime coverage for the policy period. Even if a claim isn’t filed against you until 10 years after the incident, if the incident occurred during the policy period, you are covered. A claims-made policy, alternately, will only cover claims made while the policy is in effect (or if an optional extended reporting period is purchased). Insured: It is important to note what is being defined as insured. Your professional liability insurance policy can provide protection for an individual or a corporation. If your professional practice is incorporated, you should take out a corporate policy so the business entity is protected under the definition of the named insured within the policy. Limits of Liability- Per Incident: This refers to the maximum amount that can be paid in damages for a single claim. Limits of Liability- Aggregate: The aggregate is the total amount the policy will pay out in a given policy period. 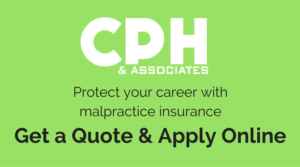 Supplemental vs. General Liability: With CPH & Associates, all professional liability insurance policies include supplemental liability coverage. This covers any bodily injury to patients that occurs while rendering your services. General liability extends this coverage to the entire premises, including hallways and stairwells, and in addition to covering patients, all people in the facility, such as family members, would be covered as well. Some entities, such as landlords, Managed Care or county or state departments, require the purchasing of Commercial General Liability. Adding CPH TOP to your policy would meet this requirement and guarantee the general coverage you need. The only way to know that you have the coverage you need is to understand exactly what you’re purchasing. Knowing these terms makes understanding your coverage simple and straightforward. If you have any additional questions regarding your policy, CPH & Associates is always happy to help.